The Montreal Canadiens stunned the Boston Bruins in double overtime of Game 1 of the Eastern Conference Semi-Finals 4-3 to take a 1-0 series lead on Friday night at the TD Garden in Boston. The game winning goal came courtesy of a blast from the point from Canadiens defenseman P.K. Subban. The end of Game 1 brought about the beginning of a whole new saga courtesy of some Bruins fans. In 2012, the Bruins were eliminated by the Washington Capitals in the Eastern Conference Quarterfinals after Caps forward Joel Ward scored in overtime of Game 7 to send the Capitals to the second round in front of a stunned TD Garden. In the days that followed, Ward, who is black, was the subject of multiple racist tweets and comments from Bruins fans who were not happy with the result. That brings us back to 2014. P.K. Subban, who is also black, was the recipient of a flood of racist tweets from angry Bruins fans following Thursday night’s game. He was also hit with a water bottle as the Canadiens celebrated their win. It’s no secret that the Canadiens have long been the Bruins’ biggest rivals. The rivalry is one of the oldest in the NHL and goes back to the days of the “Original 6” when the NHL first formed back in 1917. 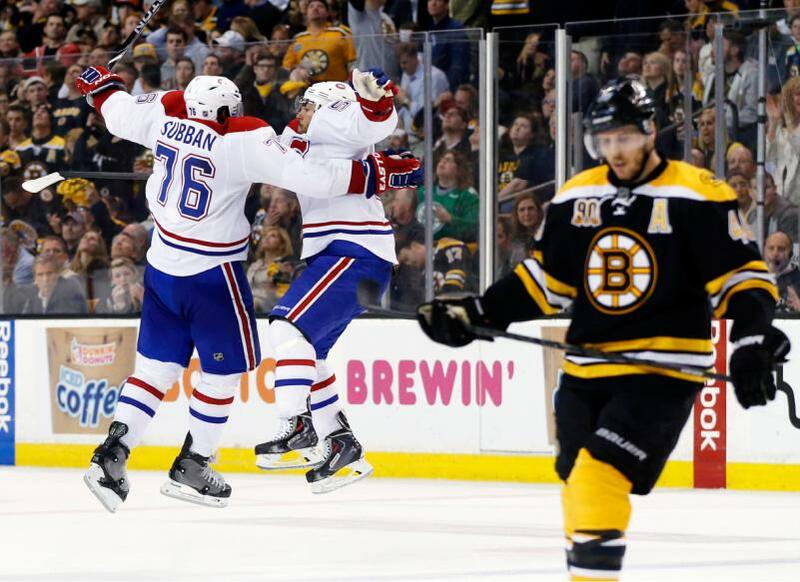 The Bruins and Canadiens have one of the most fierce rivalries in the NHL. The city of Boston was praised for their resiliency following that tragic bombings during the 2013 Boston Marathon. I have always considered them to be on of the best, most passionate fan bases in the country. As a member of a fan base that is routinely (and incorrectly) stereotyped when an incident occurs involving one of our fans, I am fully aware that the actions of a few idiots doesn’t accurately portray the entire fan base. No one can blame Bruins fans for being angry and upset after a loss, especially a loss like that. Having said that, it is still disgusting and completely unnecessary. Being passionate about your team and not liking your rival is one thing. This is way beyond that. This is bullying and total disrespect. I was disgusted when they did this to Joel Ward in 2012 and am even more disgusted that they did it this year to P.K. Subban, whose younger brother Malcolm was drafted by the Bruins. Now, a lot of those tweets were quickly deleted. Still, A tweet or Facebook post or any other social media post is like squeezing toothpaste out of a tube; once it’s out it can’t come back in. Several tweets were captured in screenshots before they were deleted. 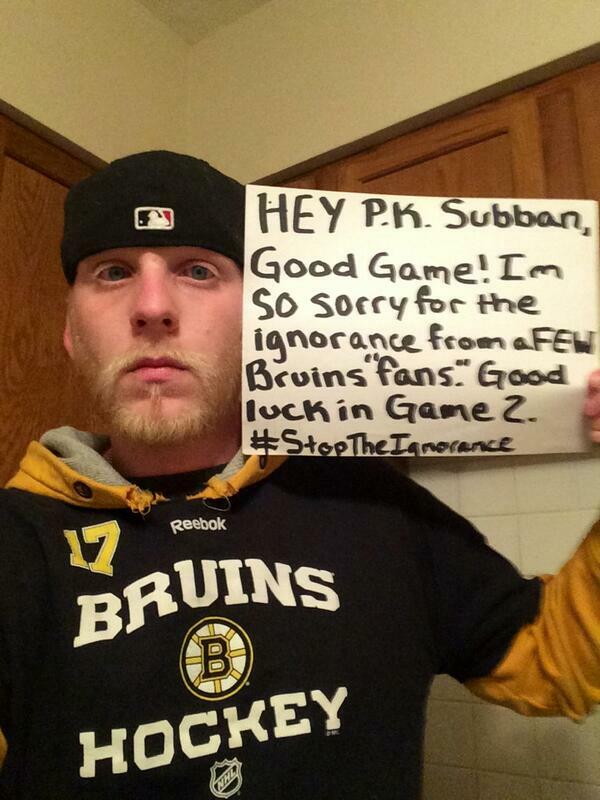 This picture was one of many signs of support for Subban by Bruins fans. Fortunately, many more Bruins fans tweeted their disgust at those tweets and many Bruins players, along with Bruins President Cam Neely, expressed their outrage with those tweets. It’s more than understandable that many Bruins fans are embarrassed by those racist tweets, and some even tweeted their support to Subban. That’s right, Bruins fans embracing a Montreal Canadien. Why? because Subban may play for the rivals, but he is a human being. Many tweets condemning the offensive tweets used quotes when describing those who sent them as fans, and they should. It’s embarrassing when the actions of a few idiots casts a dark cloud over the rest of the fan base. Listen, there’s nothing wrong with being passionate and there’s nothing wrong with hating your rival. There is, however, something wrong with not understanding that there is a fine line between sports and real-life.